DSTRYRsg: Destroyer Submission Grappling and Brazilian Jiu Jitsu: As the Grappler's Year Ends, It's Time to Take Stock of Progress and Goals. As the Grappler's Year Ends, It's Time to Take Stock of Progress and Goals. 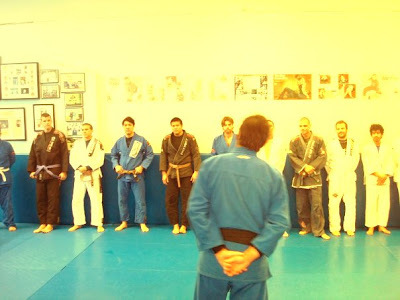 My coach and friend, Renato Magno, during a promotion of students this December 2009. One year ago (December 14, 2008, to be exact), I was awarded my black belt (along with 3 other teammates) by my coach, Renato Magno during a our Street Sports 10 Year Anniversary Celebration. Over the past week, like BJJ academies and camps all over the world, Street Sports had another round of promotions. Belt ranks and stripes were granted to those who'd put in the time and achieved certain goals in the sport. I stood beside my coach, and even gave a couple of speeches about my experiences and my love for jiu jitsu and my academy. Regardless of whether one is promoted or not, it's a great time reflect on one's progress and goals in the sport. This was my 10th year in the sport and, despite the strides I make, each year I realize there's still so much more ahead. When I was a grappling novice, I struggled with the basics - hip escapes and simple guard passes and submissions. It felt like an eternity (and actually took a very long time) before I was able to execute these simple techniques properly. Later, I developed what I thought was my "game" and tried to perfect it in competition among my blue belt and purple belt peers. My goals were to win competitions and I did that too. Over the past few years, it's been my goal to change my game and to become a truly well-rounded grappler. For me, it was stepping aside from my triangle /closed guard game - the game that had been so successful for me for so long. Looking back one year now, I'm pleased with my progress and I like the direction my training is heading. But, I'm nowhere near where I want to be and I have so much more to learn. Saulo Ribiero called jiu jitsu is a "lifetime journey," and he couldn't be more accurate. Each of us appraoches the sport in our own way and progresses individually over a lifetime (I'm assuming we all stay in it that long; I plan to). So, grappler - take a good look at your year in the sport. Assess your goals, relish your accomplishments and look forward with optimism to the year ahead ... in grappling. Wow....has it been a year already? I think I can count the number of times I actually made it onto the mats in '09. Time to get back at it! Great Post!!! Real words of wisdom.